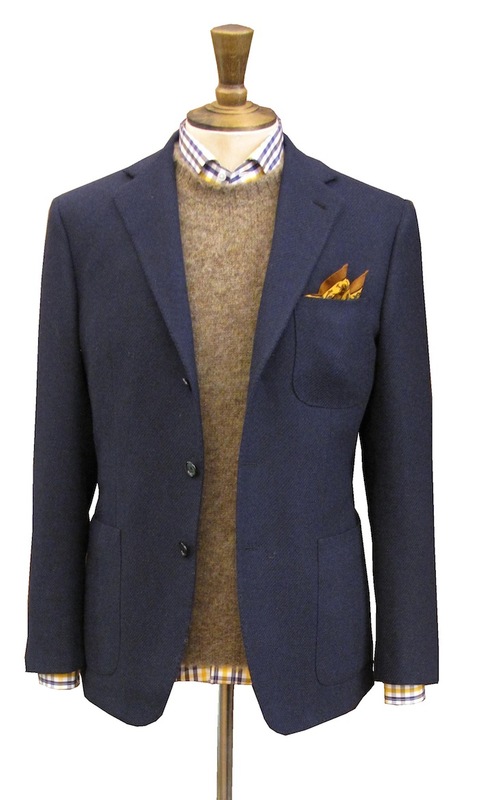 I always used to describe my style as how the Italians wear English clothes. Talking to Michael Drake recently though, (whose taste and sense of colour I respect immensely) I think the French might be a better reference point. The Italians are more obvious, because the dress is more consistent, but they also sometimes lack personality for that reason. Or personality is expressed through odd/trendy things like leather bracelets. In reality, most of western men dress in English clothes. From the French revolution until the 1970s, English business and country dress dominated, with each country taking its own slightly different slant on the lounge suit and the hacking coat, the colours of city and country. The Americans, as in many things, remained more English than the English. The Latin countries remained very conservative, but stylish nonetheless. The French, it could be argued, found the best combination of this conservatism and English eccentricity. So to Michael Drake. “I think the French are often a little more understated and a little more chic than the Italians. Italians dress more like sheep; they all look the same. The French tend to be more individual. “The French like that old English, school look. Even the Hermès jackets are very soft-shouldered, intentionally look very worn very quickly. The Italians, apart from Naples of course, are much more fitted, more self-conscious and deliberately sharper. “You see men in Paris wearing a tweed jacket with an Hermès tie: it looks like an old schoolboy look but sophisticated with it. “With colour as well, the Italians tend to be all navy and grey, or if the fashion is pink then they all wear pink. In France it is more varied, and consistently so. Look at the Hermès sweater collection – there are 25 colours or so in there, everything from lime green to orange. The Italians don’t, they’re too trend-driven. French are individual, perhaps even a little eccentric. You can follow the discussion on Michael Drake on style: English worn by the French by entering your email address in the box below. You will then receive an email every time a new comment is added. These will also contain a link to a page where you can stop the alerts, and remove all of your related data from the site. “Italians dress more like sheep; they all look the same”. I think that in average, Italians are better dress that French,but when a French is elegant is supremely elegant and chic. French elegance is synonymous of Paris. In Italy we have a Neapolitan elegance,a Milanese elegance,a Roman elegance,a Florentine elegance,a Sicilian elegance,a Bologna elegance,ecc..
Is very variegated,and often are more difference between a Milanese and a Napolitan that a Londoner and a Parisian. Another Italian advantage is that bespoke tailors are still numerous and often affordables. Said this…yes, French interpretation of English style is very sophisticated. Two perfect examples of the blue-brown combination in the photos! I agree with quite all you have written on this post! Interestingly enough, both jackets match my own taste! The navy one is exactly the kind I desperatly need to add to my wardrobe. Good to know that Agnès B. are going to sell them here in France. I only hope that they won’t be out of my financial reach! Now, the one thing that surprises me on this post though, is that my type of style were “old schoolboy”! 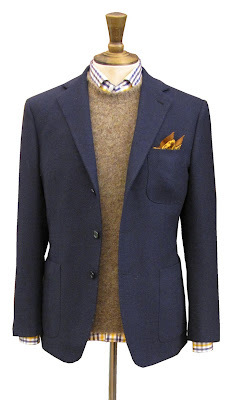 Yes, tweed and glen plaid jackets paired with Hermès and Drake’s ties are the kind of outfit I prefer! Only recently, have I started thinking about changing pace by adding flannel to my usual 14 wale corduroy trousers. To start with and following your advice, Simon, I have been looking for, at least, one pair of mid grey heavy flannel (cf. piece on matching texture and color). But what a real headache looking for them in Paris! Frankly, I have come to think that perhaps this kind of stuff is simply not produced anymore. Hi John – thanks for your comments. Agnes B are not about to stock these jackets though. Michael is referring to when he first started, over 30 years ago, and he is referring to ties and scarves, not jackets. OK! As a matter of fact,it was surprising to me. I would fairly think of the Parisian “Old england” instead as the right place for these kinds of products, even though Drake is obviously moving within a group of bold British craftsmen who are now on the verge to make up a new generation, and yet that is so far rather individually confident & assertive. I am not sure whether indeed they are fully aware of belonging to this wave whose main feat will sooner or later be translated as “the Brits are back”. Think of what Eric Musgrave once wrote about the Craftsmen at Northampton to understand what I’m getting at. Due to your very keen eye, perhaps you, Simon, could be helpful to them all and to all of us. I say this because the world deserve – yes – products made by outstanding craftsmen, no matter where about they are from! It just happens that for specific products, they have been crafted by Brits!